If anyone´s wondering where I am at, check out the Me-Made-May 2012 flickr group, and there you´ll find me! I thought I´d share some of my outfits with you here on the blog as well, and I´ve put together a collage of the first couple of weeks. If you click on the image it´ll take you to my MMM´12 photo set on flickr, and there you will find more detailed descriptions of the different garments I am wearing. 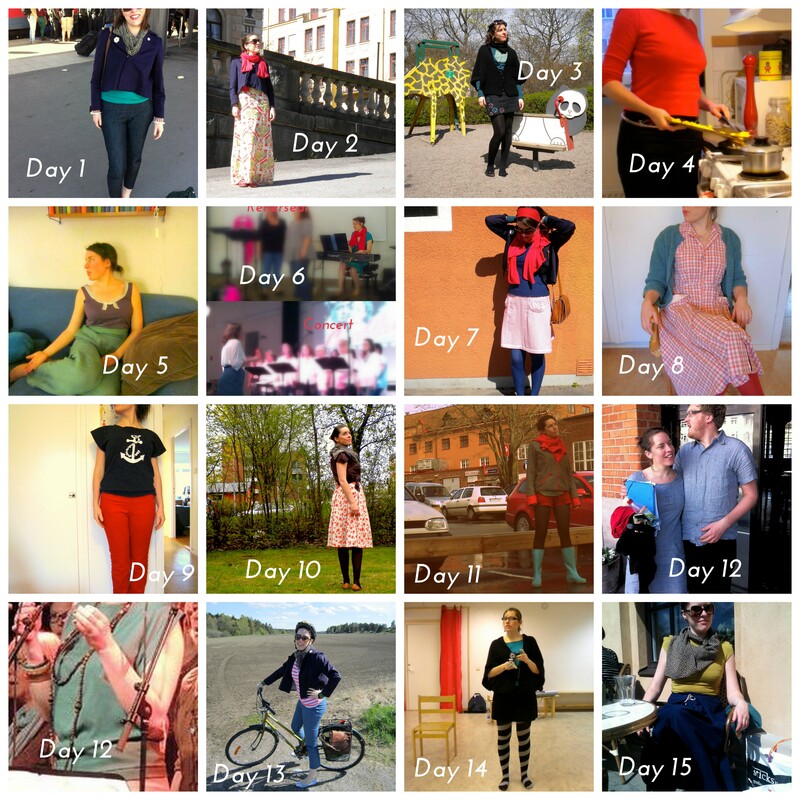 I am enjoying this May a lot, and as always, it´s sooo inspiring to see what everyone else is creating and wearing! This is my sixth me-made challenge, and for me, this time around, it´s all about having fun and being creative! Yes we are wondering goshdurnit! I saw your makes on the mmm flickr so I knew you were alive, but even so! I’ve been enjoying all your pics, and it’s fun to see the collage. This is my 4th me made and I have been much more relaxed in my approach. My focus is on styling the items I have, and learning form others. So glad to see you posting! I’m not doing MMM this time around, but of course I love looking at what everyone else is wearing. That boatneck top especially caught my eye! I am so smitten with all of your bright colors! I’m definitely inspired to branch out. I always love seeing your MMM progress — so many lovelies. I love the variety of what you sew, so inspiring! Love seeing your outfits and I Love your wellingtons! Lots of fun outfits, Solvi! 🙂 I’ve sadly not managed to keep up with the flickr feed, but I’ll have to slowly go through it soon!